The hm 2.0 series of hard metric connectors was developed in accordance with the international IEC 61076-4-101 standard. These shielded connectors have a pitch of 2 mm and are suitable for applications that require high contact density and reliability. Standardization ensures that the connectors are compatible with products from different manufacturers like Harting, Erni, Hirose and TE etc. Developed for high speed telecom backplane and PC104 for embedded systems, the signal connector for CompactPCI hardware platform is a classic example for the use of hardmetric connectors. The ‘hm’ 2mm is a gas tight, high density pin-and-socket connector which meets the IEC-61076 international standard. These connectors are now being used more and more in the computer / peripheral market as well as the industrial and instrumentation markets. Important parameters such as the fixing, shielding and coding of the printed circuit boards are compatible regardless of the individual application. 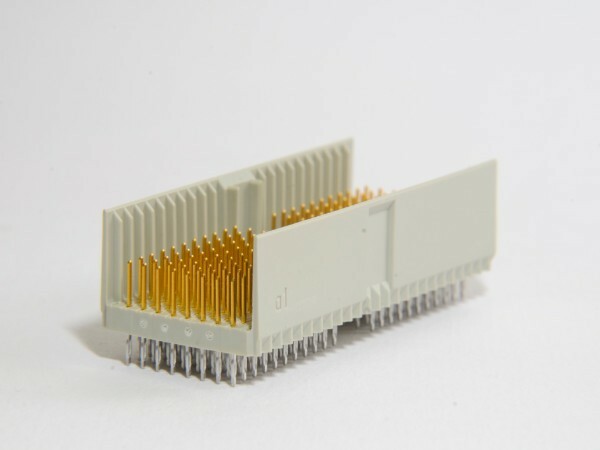 ‘ept’ offers 5 row and 8 row 2.0mm hard metric connectors according to IEC 61076-4-101.
hm 2.0 modules offer a number of possibilities to optimize large contact densities, especially in combination with coaxial or fibre-optic connections. ept hm 2.0 connectors can be easily connected in series to form a continuous 2 mm grid. This grid pattern is advantageous when creating a printed circuit board since no space is lost in the individual connector modules. The ends of the insulator material are chamfered to simplify the connection of additional modules and avoid twisting the connectors. The chamfers ensure exact positioning on the printed circuit boards and stabilize the modules. The connectors must be coded in a modern BUS system to avoid mixing up the printed circuit boards. “Coding keys” can be manually snapped onto the multi-function block of the connector types A, D, L and M. The different inserts are colour-coded and can thus be kept apart. The modules A, D, L and M are equipped with a multi-function block. This in turn can be equipped with the coding keys. The moulded guides ensure the correct alignment of the male and female connectors to each other and they offer anti-twist protection before contacting. The coding keys can be inserted or withdrawn using a simple insertion or withdrawal tool. ept offers three different lengths for the front and four different lengths for the rear side. The different contact lengths are necessary because certain signal or ground contacts need to be the first to be connected/disconnected when adding/removing a module. The 11.25 mm contacts are mainly required for the shielding rows z and f.
Insertion and withdrawal force (per contact) – 0.75 N / Shielding 1N max. The product family includes all standard types and variants for CompactPCI, Hot Swap and CTI (Computer Telephony Integration). The modules are defined as the 5+2 row types A, B, AB and C and the 8+2 row types D, E and DE. The PICMG® standards for CompactPCI provide specifications for hard metric connectors. ept’s hm2.0 connectors are optimally suited for use in CompactPCI applications.